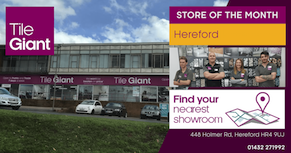 The four members of staff are headed up by Store Manager Joe Box and we spoke with Joe to find out a bit more about the team at Tile Giant Hereford. This October we’re delighted to launch six beautiful collections in partnership with Homes & Gardens magazine. Find out more here.